What: Loads of fun is to be had with activities ranging from colouring in, crafts and reading followed by the screening of The Lorax. When: From 9am, movie starts at 10am. 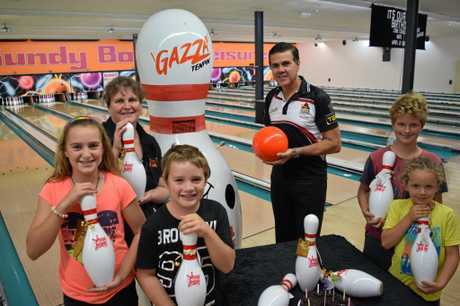 What: There is so much to choose from at Bundy Bowl & Leisure Centre these school holidays. From ten pin bowling, laser tag, dodgem cars, Wild Wild West Shootout, mini golf, a Giant Balloon Drops each day at 12 noon with giveaways and more. Cost: Visit www.bundabowl.com.au or call the centre for holiday specials. What: A week of exploring drama, singing and performance skills. Participants will work with artists & mentors to produce a piece of musical theatre for friends and family in a fantastic performance of The Tales of Dr. Seuss to close the week. There is an option to attend our 3 day Dramashop or 2 Day Musical theatre Singshop separately. 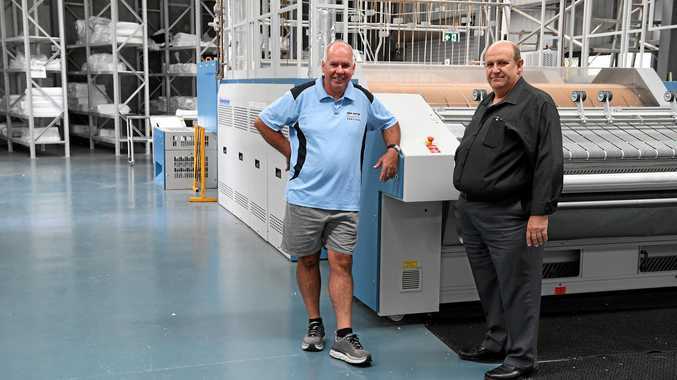 A performance will be held at Riverfeast Bundaberg on Saturday from 2pm. This performance will include all of our acts from our various holiday workshops from musical theatre to vocal acts. 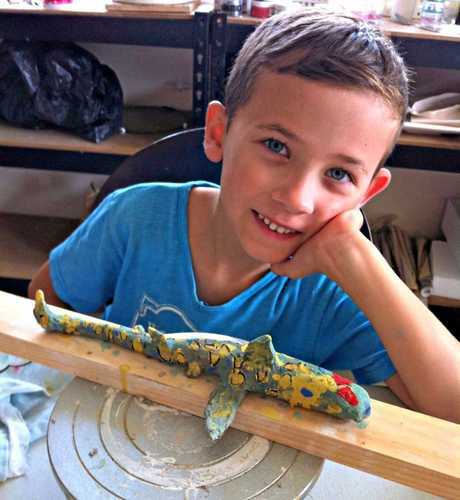 What: Two-and-a-half hour long pottery classes teaching children how to create an amazing piece of their very own pottery through Di Stirling Pottery. What: Aerial Arts Academy is hosting a three day kids workshop open to ages 4-10 years. Activities include: dance, acrobatics, craft, antigravity fitness, games, dress up's and singing. What: The adventure begins with you putting pen to paper, turning words into a song and your song into your very own CD single. Local songwriter and performer Matthew Barker will guide you from songwriter to recording artist. 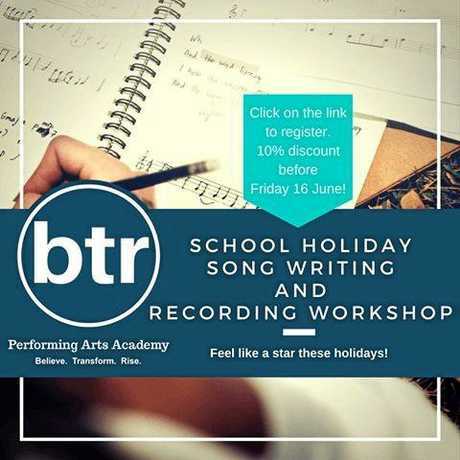 While singing coach Natalie Greer will guide you safely through various vocal techniques and Blair Warwick will be ready to 'Record your moment in time'. 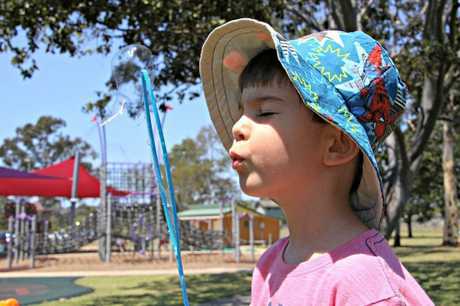 What: Australian Sugar Cane Railway will run train rides again these school holidays at the Bundaberg Botanic Gardens. The Australian Sugar Cane Railway is disability friendly and wheelchair accessible. 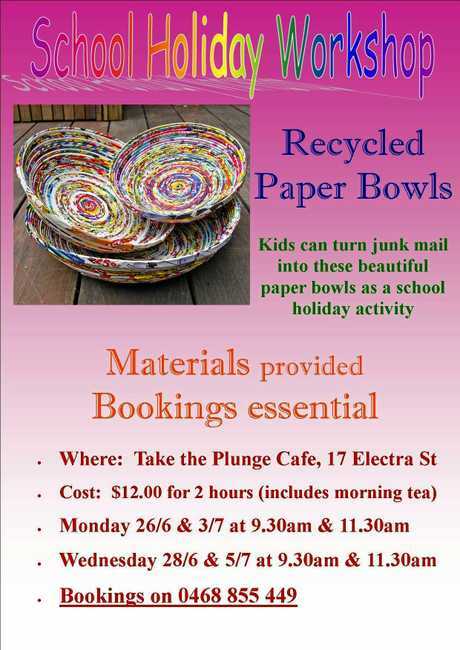 What: Kids can turn junk mail into beautiful paper bowls with many uses at Take the Plunge Cafe. Spend a morning rolling, folding, flattening and gluing paper to end with an amazing and fun creation. Two hour workshop includes morning tea (juice & cookies). What: Community Lifestyle Support are hosting the Feed Me - Interactive Kids Food Awareness Workshop. 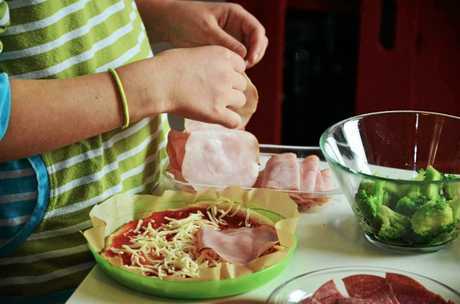 Kids will be exposed to many sensory experiences to help develop their awareness and familiarity with food. The workshop will focus on food types, textures, colours, shapes, sizes, smells, tastes and sounds. What: Childers Library School Holiday Activities will be on again with today being 'make your own penguin friend' activity for kids aged 2-8 years. What: Kids Games Holiday Program is in Bundaberg for the holidays, bringing games for kids aged Prep-Year 6. What: Drop-in for a game of lawn bowls. A family friendly game of affordable fun with no experience required.